As lithium-ion batteries are widely used in smartphones and other rechargeable devices, it is hard to imagine replacing them. However, the increasing lithium price has induced a search for alternatives. One promising battery technology uses abundant, easily available seawater. Researchers are now one step closer to making a sodium-air, seawater battery. The new study is published in the journal ACS Applied Materials & Interfaces. Sodium-air - or sodium-oxygen - batteries are considered one of the most cost-effective and promising alternatives to the lithium-ion batteries available today. However, there are some challenges that have to be solved before they can be made into a commercial reality. Youngsik Kim, Soo Min Hwang and collaborators have been tackling these challenges by using seawater as the catholyte, a combination of electrolyte and cathode. In batteries, the electrolyte is the element that enables an electrical charge to flow between the anode and cathode. 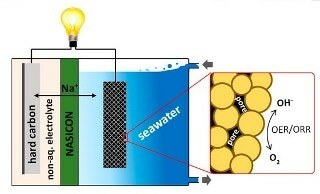 A continuous flow of seawater in and out of the battery supplies the sodium ions and water needed for producing a charge. However, the reactions have been very slow, so the investigators wanted to find a method to speed them up. The team prepared a catalyst with porous cobalt manganese oxide nanoparticles for their new battery. The pores make a large surface area to support the electrochemical reactions needed for producing a charge. A hard carbon electrode is provided as the anode. The resulting battery performed efficiently over 100 times with an average discharge voltage of around 2.7 volts. According to investigators, this doesn’t measure up to a lithium-ion cell that can reach 3.6 to 4.0 volts, however, they are moving closer to bridging this gap. The study authors received funding from the Ulsan National Institute of Science and Technology (Republic of Korea).